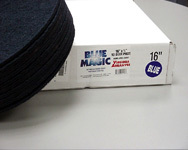 Virginia Abrasives innovative techniques have resulted in the development of the Blue Magic Pad. This superior solution for ‘between coat’ preparation of floor finishes has minimised problems associated with the re-coating procedure. Gone are the days of using ‘used’ mesh screens or strips of sandpaper on pads which leave swirl marks, scratches or haze between layers of finish coat such as tung oil or oil modified seal, waterborne and polyurethane finishes. The advantages of using the Blue Magic Pad are superior abrasion between finish coats, without removing large amounts of finish coating material. This allows for a higher film build generating very little dust. This pad is very economical as the grain is throughout the pad allowing for greater square metre coverage than obtained from mesh screens. Most importantly, the Blue Magic Pad does not leave scratches between coats while still knocking down the grain raise from seal coats.